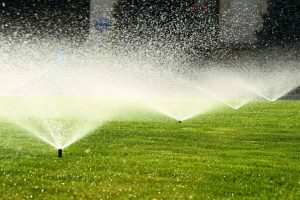 Watering your lawn is something that is essential to maintaining a good-looking yard, but many people don’t know the best way to properly perform this task. Here, we will go over the basics of a proper watering cycle. When you decide to water can make a big difference on how beneficial your watering cycle is. Furthermore, the time of day you choose to water can also affect the efficiency of your watering cycle. You want to avoid the hottest parts of the day, when the water will more quickly evaporate. Generally speaking, you shouldn’t water between 11 a.m and 3 p.m. Watering in the evening is also not recommended, as it turns your lawn into an ideal breeding ground for mildew and fungus. However, if you must water in the evening, do it between 4 p.m. and 7 p.m. The ideal time to water your lawn is between 6 a.m. and 10 a.m. This allows the water to fully soak in, and gives your lawn the full day to dry out again before the evening arrives. You should be providing your lawn with a ½ inch of water twice a week. This shouldn’t take longer than 30 minutes per session. To get the most accurate idea of how long you should be watering, consider placing a few rain gauges around your yard, and check them as you are watering the first few times of the year. This will let you know how efficient your sprinkler system is. Now that winter is over, it’s time to start working on your yard again. Give us a call today for any and all landscaping services in Fort Collins.